The market responded positively to De Grey Mining’s (ASX: DEG) announcement on Thursday that it had secured an exclusive and binding 12 month option to evaluate and explore with the right to acquire the highly prospective Indee gold project within 18 months. The Indee gold project abuts DEG’s Turner River project located near Port Hedland in Western Australia as can be seen below. 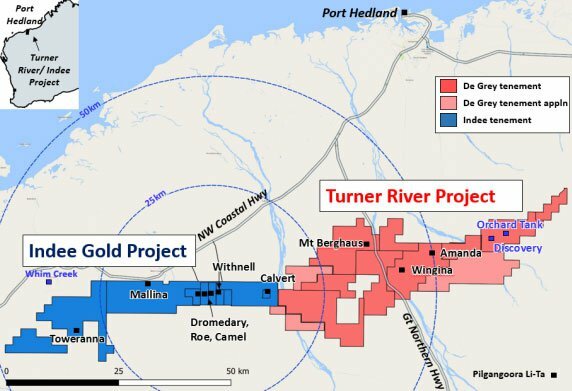 The Indee gold project represents a large contiguous landholding covering an area of 414 square metres adjacent to DEG’s Turner River project which covers a further 823 square kilometres. The project comprises granted mining and exploration licenses with existing defined in situ shallow gold resources, a large advanced near-term exploration target (Mallina), other walk up drill targets and longer term exploration upside. Importantly, the Indee project has a pre-mining resource statement featuring 10.46 million tonnes grading 1.6 grams per tonne gold for 529,000 ounces as published by the previous owners, Range River Gold, in March 2005. While this resource was reported to JORC Code 2004 standards and as such is not totally compliant with JORC 2012 standards, it provides a guide as to the mineralisation, the size of the resource and the prospect of further resource definition. Furthermore, investors should be advised of an upgraded JORC Code 2012 resource by March, a development that could prove to be a share price catalyst. Of course it is early days in this play and any catalyst is speculative, so investors considering this stock should seek professional financial advice. It should also be noted that there is 851,000 tonnes of crushed material in surface stockpiles, as well as exposed gold mineralisation in five partially mined shallow open pits. DEG also has access to past mining and exploration information which will assist in determining potential drill targets. In commenting on the strategic benefits of the Indee agreement, DEG Chief Executive, Simon Lill said, “This acquisition not only consolidates ownership of the regionally significant and highly prospective Mallina shear zone, but dovetails very well with our Turner River project and fast tracks De Grey into development studies”. 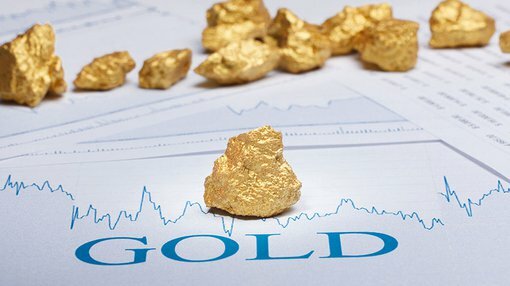 Lill highlighted the fact that the potential scale of the combined assets would place the group within reach of a small and select group of ASX listed gold developers. Second quarter resource drilling at Mallina and the group’s established Mt Berghaus prospects should assist in supporting Lill’s expectations. This will also coincide with the commencement of detailed feasibility studies. FinFeed discussed this latest development with analyst Michael Beer from Beer&Co. He initiated coverage on the stock in November with a speculative buy recommendation. At that stage, based on an Australian dollar gold price of approximately $1730 Beer determined that DEG should generate a maiden profit of $10.8 million in fiscal 2019. While the spot gold price based on a slightly stronger Australian dollar than that projected in Beer’s forecasts is tracking in the vicinity of $1630, the numbers still stack up well. Based solely on the established Turner River project, Beer estimated production to increase from 27,000 ounces in fiscal 2009 to 83,000 ounces in fiscal 2020, resulting in net profit increasing to $58.3 million. Commenting on the Indee transaction, Beer said, “This is a great transaction for DEG as the Indee gold project already contains known gold resources and has previously proved through its gold production via heap leach that oxide recoveries are excellent”. He also believes there is strong exploration potential with the addition of 60 kilometres of the Mallina shear zone.